While the Sony a9 Gold award and an overall score of 89% stands, DPReview has revised multiple parts of their studio scene due to faulty testing spotted by form members. You can read about how the error was found here, but in brief, the red channel was found to be the sharpest channel and it should have been the green. Also of interested Jim Kasson, author of the last word is one of the forum members credited with the find. Congratulation on his excellent technical work being recognized by DPReview. I think DPReview should have revised their final results a little to better reflect the find and acknowledge that the camera isn’t necessarily bad for portraiture. 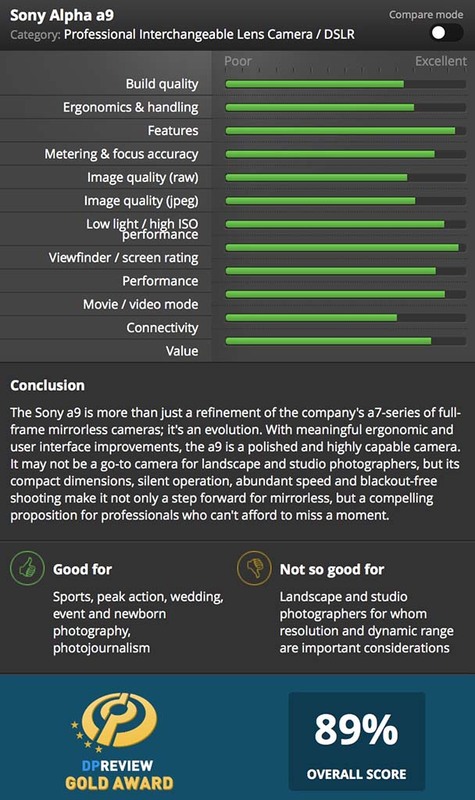 Maybe bump the a9 up to a 90% overall due to the error. The results should make a substantial difference for pixel peepers.